The first thoughts that come to mind when picturing sand dunes is an arid, inhospitable environment. Scratching an inch or two below the surface reveals the sponge like nature of The Great Sand Dunes, allowing for bursts of green and yellow in wind sheltered pockets. Très bien agencée cette image et qui me rend optimiste. 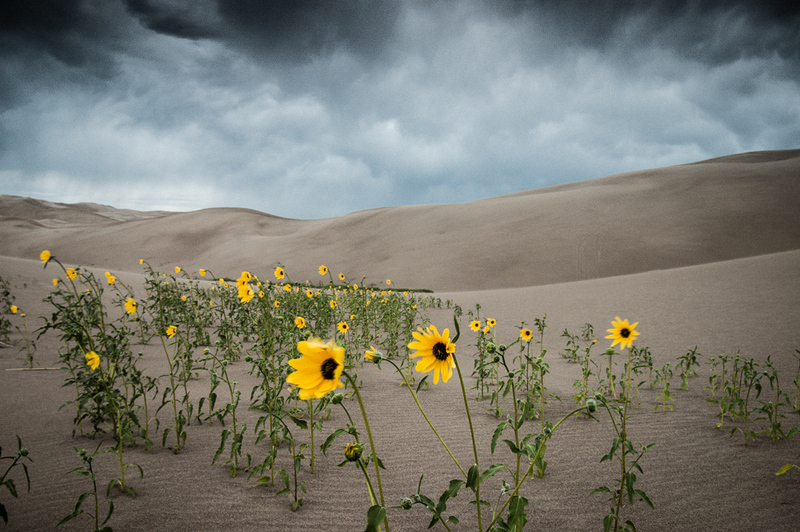 Has a rather unreal feeling, seeing the sandy, dry landscape with the sunflowers growing. Wonderful landscape! I especially like this contrast of desert and nature – well seen and good composed. this is a surreal shot. unexpected place for sunflowers.